While helping a friend with her booth for a trade show, we learned how to install grommets simply and frustration-free. If you need grommets installed for a craft, drapes, shower curtains, drawstring totebags, or your handsewn tent, DO NOT think that a grommet kit from a fabric store will be sufficient. Try to get a semi-industrial kit from the hardware store. They are heavier duty and the pricing is more reasonable. 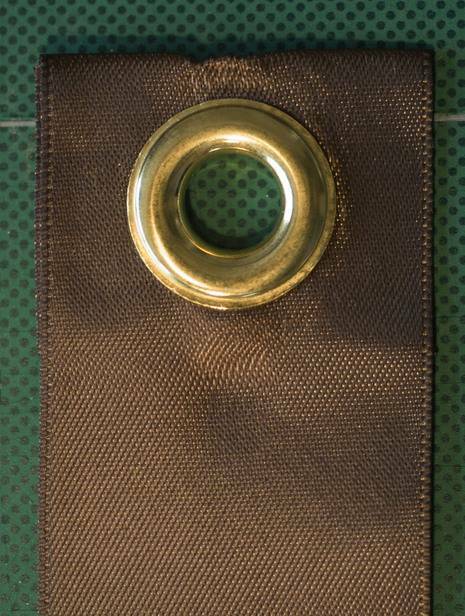 If you really want the jumbo grommets, take your project to a drapery workroom and see if they'll install them for you using their very expensive, heavy duty equipment. By the way, the term eyelet is used when referring to small grommets and grommets are most commonly made from metal or plastic. Before we started, we folded one end of the ribbon over and with fused a fold with fusible hem tape. The grommet works best if it is inserted through a double layer of fabric or ribbon. 1. Measure where you want the center of your grommet and mark with a pencil. 2. Take the grommet hole punch and center it on your mark, pound to make an indentation. 3. Using an exacto-knife or razor, cut an "x" inside of the circle you pounded in to your fabric. 4. Using sharp, tiny scissors, cut out the circle. 5. On right side of fabric, insert the main grommet piece (the one with the protrusion) through the hole. 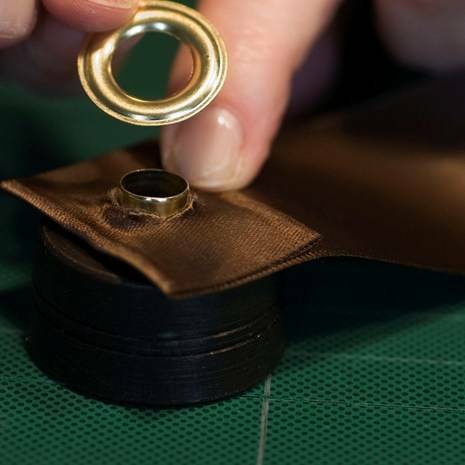 On the wrong side of your fabric, place the ring on top of the protrusion with the domed side facing up. 6. Take the short, round grommet tool with the hole through the middle and place it on a solid surface. The top of this piece has a small groove in it so that the right side of the grommet fits down in it a bit. Now place the larger grommet tool down through the center hole of the grommet. Check to make sure you are going to pound the grommet in place with the wrong side of the fabric facing up. Hit solidly with the hammer five times. Check to make sure the seal is tight around the ring. If necessary, use the flathead screwdriver to pry the pipe tool off of the grommet. Flip fabric over and admire your professional looking grommet. I am making a corset. Using a kit from a fabric store. They did not work at all. I was using a pleather fabric with a felt lining. The grommets didn't stay in the fabric. It seemed there wasn't enough thickness to hold them in. any suggestions? I've had a grommet kit for a number of years, and your demo was great, but I've never had to cut out a hole by hand in any of the fabrics I've used it on. The fabric punch can be sharpened (only around the outer edges) and you could also try a different cutting base than the small piece of wood that comes with the kit. 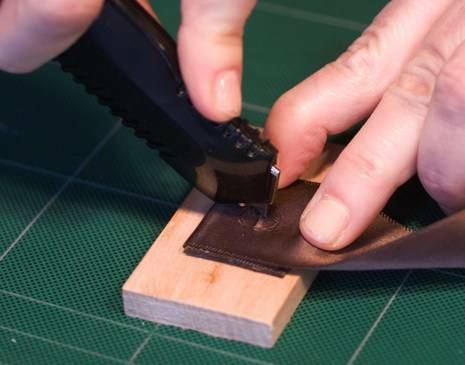 A scrap of linoleum for example, and a little more tapping should cut straight through the material leaving a clean round hole, which is less likely to tear. May I suggest instead of CUTTING the hole- use an Awl (like a ice-pick) to POKE through the hole and enlarge it by increasingly larger fids/marlinspikes/screwdriver/ whatever's at hand- to enlarge it. An awl-poked hole is MUCH stronger for the grommet- as the fabric is displaced, not cut- as the structural integrity of textile- warp & weft remain intact. Such a awl-poked hole will last indefintely and not tear esepcially at the grommet. THis is how military tents, tarpaulins, sadles and riding tack etc are made. Anon-I don't know how you'd do it. I've been looking for a source for SMALL all-white grommets for garment work (on the scale of 1/4" max). I can find small ones in mixed packs at fabric and craft shops, but I don't want or need the other 200 red/black/silver/brass ones! Can anyone make a suggestion? vicki[dot]scarpato[at]gmail[dot]com Thanks! Anonymous- Thanks so much for leaving a comment. You'll find all sorts of handy stuff right here on Curbly. Plus, I love the graffiti painted canvas idea and the grommets are the perfect way to hang them. If you'd like, send photos of them to me to post or post photos of your project youself right here on Curbly. So I have these two large pieces of spraypaint graffiti canvases (6ft x 3ft) that I've been wanting to hang. I went through the phonebook and talked to all the sign and banner places, even leather places, to see what would be the best way to go about getting grommets put into the canvases. Nobody would help me, for "fear of damaging the artwork". Well, I stumbled upon this site, and decided to do it myself. I went to my local ACE Hardware, and purchased a good Grommet kit for $8. Following these instructions, I was able to figure out that grommetting is one of the easiest things ever. I just used an extra piece of fabric that's used for patching clothing to hold the grommets tighter to the cloth. Wow, I'm really glad I stumbled upon this site. Thanks a lot! Great bags. That quilted flower bag could give Vera Bradley a run for her money. this was a life-savier....thanks! I bought the tool from the fabric store and it was useless and I wasted lots of grommets. I took your advice...went to the hardware store and bought the industial tool. It works beautifully! Miki-Thanks. I hope it helps with some creative grommet project. I have been trying to figure out how to set grommets forever! This is by far the best explanation I have seen. Thank you!! And yes, the photos are awesome! I've been setting various size grommets for years, and can offer that after imprinting and "X" cutting the hole, it really isn't necessary to cut out the hole - which can be very cumbersome when on the smaller sde. If necessary, just cut off the tips of each point of the "X" cut so as not to show outide the grommet edges once set. 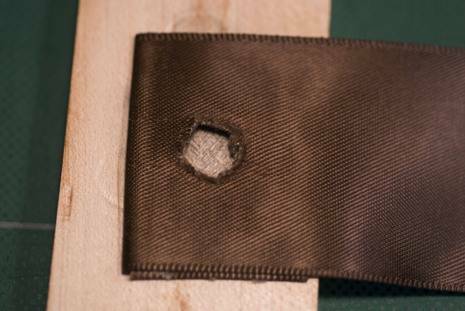 This method will actually offer needed fabric support for placing and securing the grommet without taking the chance that you've cut the hole too wide, leading to the likelyhood of the fabric slipping from the grommet in the future. Well, funny you should ask. I borrowed a camera to try out. I think it was a very expensive Nikon. I thought they turned out great. I don't think I have the dough to buy one of those. Nice how-to! The pictures are great quality! What camera do you use?